A wheel-selfie from the Curiosity rover gives space watchers one of the best views yet of the damage caused by rolling over rocks on Mars. Mars isn't all smooth sailing for NASA's Curiosity rover. Toodling around the Red Planet has taken a toll on Curiosity's wheels, as seen in a new rover image, released Tuesday. Curiosity landed on Mars back in 2012 and the machine is currently checking out a fascinating set of dunes, which are visible in the shot's background. The image gives a wonderfully close look at Curiosity's left front wheel. On display is a jagged hole in the center of the wheel, located beneath some intentional, built-in holes. The central hole is just the largest of several gaps caused by small rocks on Mars' surface. The rover's six wheels are made of aluminum, with cleats designed for traction. NASA notes that the wheels and legs "are built to be tough." Each wheel is 20 inches (0.5 meters) in diameter. Take a good look at Curiosity's wheel-hole. Curiosity passed the 10 kilometer (6.2 mile) mark in distance traveled in April of 2015. That's nothing to a set of car tires on Earth, but the rover faced some particularly rocky and rough terrain. The left front wheel seems to have taken the most bruises, but the other wheels are also full of dings and dents. The rover regularly photographs parts of itself, giving scientists back on Earth a good look at the wear and tear. NASA has been closely monitoring Curiosity's wheel damage since at least early 2014 and is developing methods to minimize the deterioration. The agency is carefully planning the rover's path to take it over as smooth a terrain as possible. NASA has also implemented reverse-driving to reduce wear. Curiosity's mission is far from over, so conserving the wheels is important. While the damage looks dramatic, the rover is functioning just fine and NASA's protection measures seem to be working. 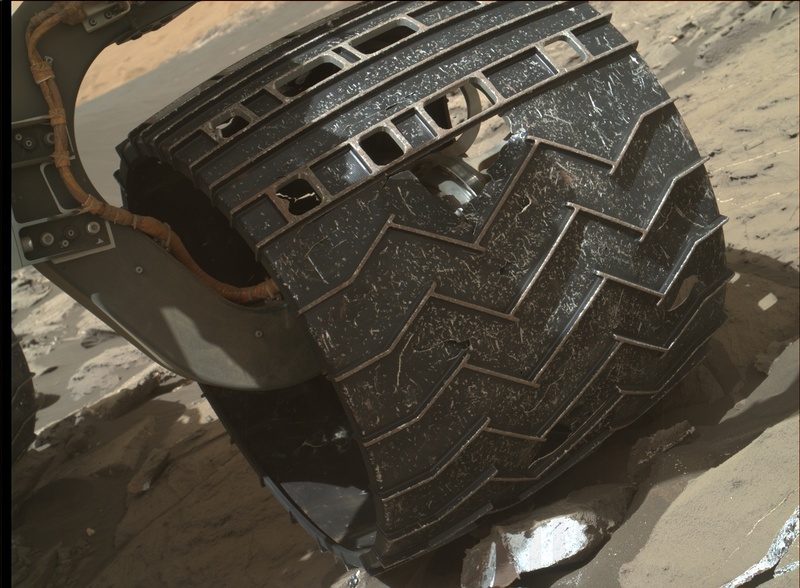 Here's an interesting wheel tidbit you may have missed: Curiosity's tracks spell out, in Morse code, "JPL," for NASA's Jet Propulsion Laboratory. Everywhere the rover goes on Mars, it leaves behind a reminder of the people who built it.